A robust drill suited to portable drill application. Double ended self centering drill designed to produce accurate holes in thin materials. For drilling materials of low tensile strength. 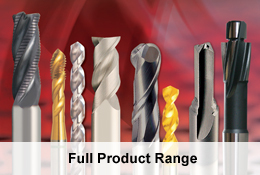 Ideal for use on CNC machines where high productivity and accurate holes are required. For general purpose long reach drilling. Ideal for use on CNC machines where high productivity and accurate holes are required. High performance deep hole drilling. For accurate positioning of holes. Ideal for CNC lathes. Alternative to using Centre drills. For general centering operations on workpieces requiring additional machining between centres. For centering operations as in Type A, but to produce a protected centre. Same as Type A, but produces a radius centre suitable for a variety of male centre angles. For drilling concrete, brick and tile. A wood auger for drilling all types of wood.